Chinese Experts Ask Foreigners To Retrace The Long March, But, Um, Foreigners Already Have? 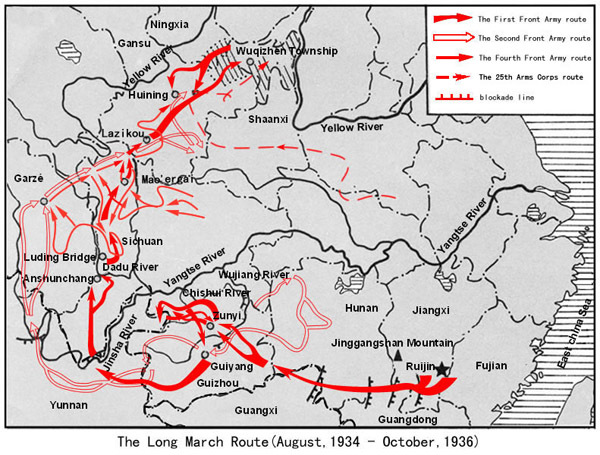 Ed Jocelyn and Andrew McEwen retraced the route in 384 days, was initially extolled by state media, then derided when they published a book that accused Mao Zedong of severely overestimating the length of the march and propagandizing it beyond recognition. Granted, they had no evidence to base their revisionism, but I must ask: are they invited? Mao considers this dialectically. The woman is clearly mad. Yet she is beautiful and the tank seems to work. How did she get through the sentries? Didn’t the noise of the clanking tank treads wake the entire camp? Where is everyone? Mao realizes the camp is empty. He is alone with Garbo. But Mao has always been more attracted to Harlow than to Garbo. What should he do not to break her romantic little heart? “Madame, I have work to do,” says Mao gently. “It can wait till tomorrow, my love,” she answers, unzipping her coveralls. Garbo hangs her cap on the mouth of the tank’s .375 recoilless cannon. And that night Mao instructed Garbo in the Chinese Way, the Five Paths, and the Three Encirclements. Note: in all likelihood, Tuten never retraced the Long March, but one wonders what kind of book he might have produced if he did. We say: bravo to those 40 experts who have invited foreigners on this amazing journey through the pages of history itself. We eagerly await the new, scholarly, provocative, intelligent, critical, didactic, dramatic tales to emerge out of this campaign. Yang Xiannong, a professor from the academy, argued that letting foreigners walk the route is the best way to make them know how hard the Communist Party and its leadership worked to survive and develop. Didn’t them walking it mean they did have evidence? Or did they not bother to measure? The CPC claims the route was circuitous, as they often doubled back to evade or fight. The authors had no HARD evidence, though one of them claimed that Mao “doubled” the actual distance, so that discrepancy deserves to at least be noted. Don’t hold your breath on any official revision of the 12,500-km figure though, which is another of those “5,000 years” numbers. The length seems arbitrary, in regard of what it signifies. I will allow a bit of discrepancy, but not as much as “double”. Certainly, recreating conditions are essential too. Sigh. I shouldn’t be drawn on this, but… What might “The Tao” regard as HARD evidence, I wonder? Anyway, we didn’t need to measure it to know it wasn’t close to 12,500km, because the Red Army’s own records say so. Look it up, if you care to do some research of your own. And by the way, “pseudo-foreigner”? Grow up and learn some manners. Shouldn’t be drawn into this either, but I’m confused by why you find the phrase “pseudo-foreigner” offensive. Sun Shuyun is a Chinese national, after all. And if the Red Army’s record is such public knowledge, perhaps you’d like to enlighten us with a link. The Red Army website has the info splashed across its frontpage, yeah? Or be smug about it, whatever. Or were foreigners with such summarily rounded up, imprisoned and deported for contravening some “Ancient Chinese Secrets”?